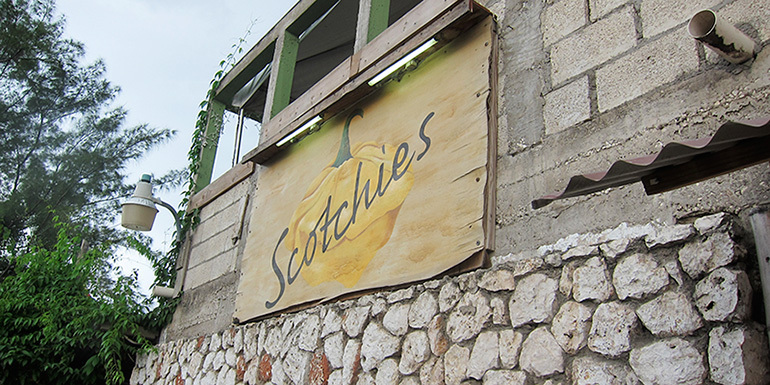 It’s a 15-minute drive from the cruise terminal, but Scotchies in Ocho Rios is worth the cab fare. Named for the scotch bonnet pepper the establishment’s famous hot sauce is made with, Scotchies serves up its own take on classic jerk, which is meat that’s dry rubbed or marinated with a mix of spices, including allspice, cloves, cinnamon, and nutmeg. logs, creating plumes of smoke and a unique flavor. So what sets this jerk apart? While other places rake their chicken over coals and metal sheets, Scotchies places logs of pimento wood over the grill, which gives the meat a smoked, hickory flavor. Try the meat here, and you’ll never settle for jerk cooked on a street-side drum again. 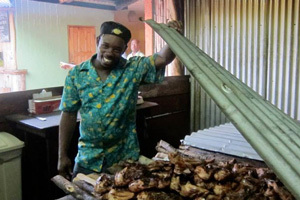 What Jamaican joint do you think serves the best jerk chicken? The chicken there is outstanding, but the pork is mind blowing. Get both! Okay, now I am dying to try the pork. Thanks for the tip!